Remove the corned beef brisket from its packaging and discard the spice packet, if any. Start smoker with your preferred wood (try hickory or pecan) and preheat to 250-275 degrees F. Put the corned beef brisket directly on the grill, fat side up, and cook for 2 hours. Meanwhile, combine the barbecue sauce and the mustard in a bowl and mix well. Pour half of the barbecue sauce-mustard mixture in the bottom of a disposable aluminum pan. After smoking for 2 hours, transfer the brisket to the pan, fat-side up. 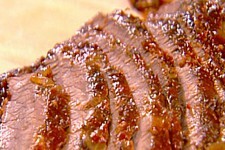 Pour the remainder of the barbecue sauce-mustard mixture over the top of the brisket and use a brush to spread the sauce evenly. Cover the pan tightly with aluminum foil. Return the brisket to the grill and continue to cook for 2 to 3 hours or until the the internal temperature reaches 185-190 degrees F. Allow the meat to rest for 15 to 20 minutes. Slice across the grain into 1/4-inch slices and serve immediately. It's great with some extra sauce spooned over it! Cover and refrigerate any leftovers, if there are any! Once you taste corned beef like this, you'll never go back to boiled again! 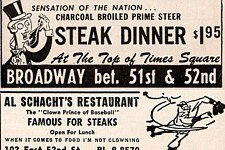 Vintage Meat - $1.95 STEAK DINNER!! I was definitely born in the wrong era! Damn inflation! 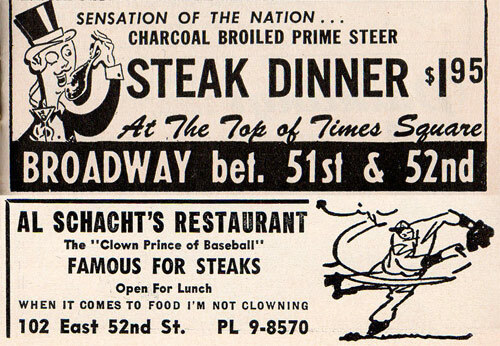 That's probably a $40 steak in today's prices. 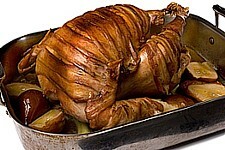 This time of year it is impossible to not dream of eating turkey! The golden brown skin and delicious, juicy meat...my mouth is watering right now. It would be pretty hard to improve on the classic roast turkey, but we here at CAD found a way...cover it in BACON! That's right, a bacon wrapped turkey. Just thinking about it brings a tear to my eye. 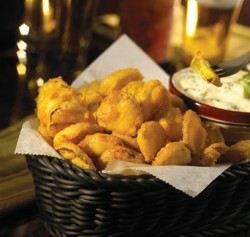 "A sandwich without meat isn't a sandwich...it's just lonely bread"
I know what you're thinking...deep fried pickles!?! Don't sell them short! The rich, salty batter and the sourness of the pickle go great together. Throw in some ranch dipping sauce and an ice cold beer and you have yourself an awesome snack! Combine flour, salt, and pepper, mixing well. Dip pickles into buttermilk and dredge in flour mixture. Deep fry coated pickles in hot oil (350 degrees) until they float to surface and are golden brown. Drain on paper towels or brown paper bags and serve immediately. Makes 8 dozen.